The first President’s Speaker Series speaker of 2019 was Robyn Maynard, a self-described “Black feminist writer, activist and educator.” Maynard’s writing has been published in major North American publications such as the Washington Post, World Policy Journal and the Canadian Women’s Studies journal and her 2017 book Policing Black Lives: State Violence in Canada from Slavery to the Present was a CBC national bestseller. 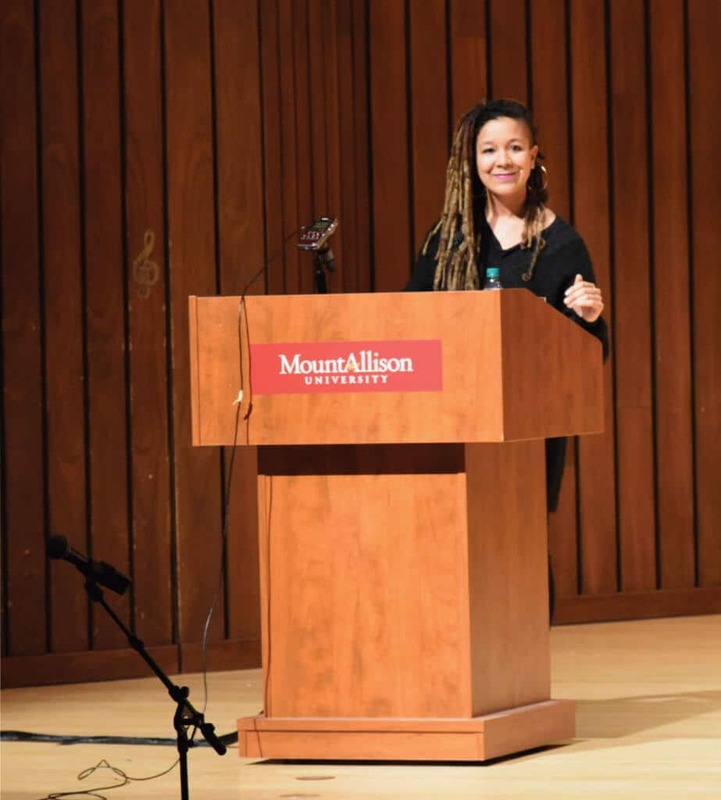 American political activist Angela Davis praised the book and noted the importance of Maynard strategically challenging “prevailing narratives of Canadian multiculturalism and inclusion by examining how structures of racism and ideologies of gender are complexly anchored in global histories of colonization and slavery.” Maynard’s talk at Mount Allison mirrored that structure – educating the audience on the centuries-old origins of what are often talked about as modern issues. Maynard emphasized that Canadians are often trained to see anti-Blackness as far away – geographically and temporally. She noted that Canada’s history of slavery and school segregation is absent in Canadian school curricula: “This is a legacy that continues to go erased as we turn to our examples of the pinnacle of racism in the United States.” Maynard emphasized that in order to fully understand and come to terms with Canada’s current relationship with anti-Black racism it is vital that we look backward and relearn our history rather than looking sideways and comparing ourselves to the U.S. in an effort to confirm the narrative or superiority that we have been fed. The first contemporary issue Maynard traced back through Canadian history was undue surveillance of Black people in the public and private realm. This manifests today in the racism that characterizes many police interactions with Black residents in Canada. Last year, the Ontario Human Rights Commission found that Black people are over-represented in cases of inappropriate stops, searches or charges. Despite making up only 8.8 per cent of Toronto’s total population, Black residents accounted for 25 per cent of police investigations. In cases of death at the hands of police, 20 per cent of white people killed were armed compared to 11 per cent of Black people. Maynard described many more examples of the Canadian government associating Black people in the public realm with criminality. She spoke about the way Prime Minister Brian Mulroney “concretized” the racial profiling we see today: “Although drugs had been decreasing in Canada since the 1970s, [Canada] followed practices in the United States by declaring a war on drugs in this country.” In Canadian media at the time, drugs were directly tied to Black communities. Maynard quoted one publication that described Jamaican immigrants as “boozy thugs who use their accents to hide amongst honest hardworking people while selling the deadly drug that turns children into thieves.” Maynard noted that at the same time as this “manufactured hysteria” was on the rise, police were being trained on a profile of a drug suspect which was clearly a stereotype of Canadian immigrants from the Caribbean. Maynard said that, during the Canadian war on drugs, “Although Black and white communities at this time were seen to deal and use drugs at similar rates, the drug trafficking incarceration rate went up for Black people 1,064 per cent,” versus 151 per cent for white people in that same time period. Maynard described the history of several other modern Canadian anti-Black practices to illustrate that “Abolishment is not a completed project.” Practices that emerged during slavery continue to persist in Canada. Throughout her talk, Maynard gave many recent examples of Canadians who were the victims of violent anti-Black racism in an effort to educate the audience. The names of those victims were: Pierre Coriolan, a Haitian man who was shot and killed by Montreal police in his apartment building in 2017; Glory Anawa, a pregnant Cameroonian woman who remains held in Canadian immigration detention after trying to escape genital mutilation in her own country; her son, Alpha Anawa, who was born a Canadian citizen and celebrated his second birthday in detention; Bony Jean-Pierre, who was shot in the head by a Canadian police officer while running away from a drug raid in 2016; Michael Mvogo, a Cameroonian man who was held in Canadian prison awaiting deportation for eight years; and a six-year-old girl who, after kicking and punching school administrators, was arrested by police officers, called by the school, who handcuffed her hands and feet in 2017. A 2018 study by the Ontario Human Rights Commission reported that Black people are twenty times more likely to be killed by police than their white counterparts. According to the Controlled Drugs and Substances Act, in 2006 and 2007, more than 6,000 migrants were detained at the Canadian border, over 400 of them for more than three months, including 162 minors.